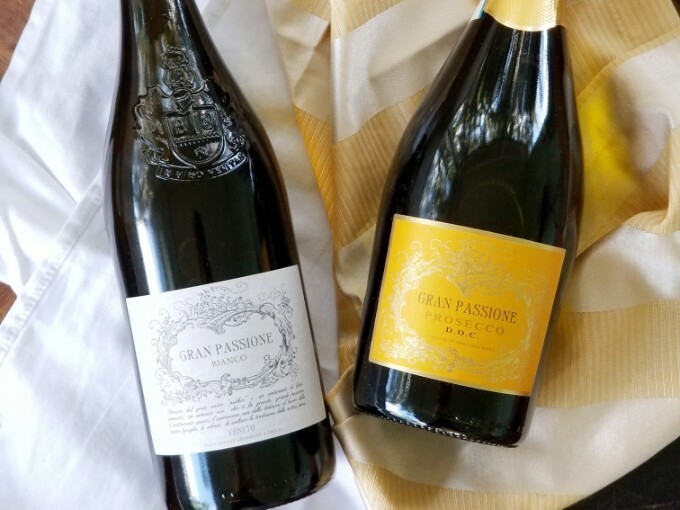 A review of Gran Passione Bianco (a white wine blend) and Gran Passione Prosecco DOC Spumante. Both wines originate from Veneto region of Italy. Thank you to Winesellers, Ltd. for providing wine for this review. All opinions are my own. In summer, white wines are a welcome relief from the heat. Their crisp flavors refresh even on the hottest of days. Today I’m sampling a pair of wines from Italian winemaker Gran Passione. Gran Passione Bianco is a full-bodied white wine blend from the Veneto region of Italy. The Veneto region is located in northeast Italy near Venice, and is known for its elegant white wines. This wine is a blend of 80% Chardonnay grapes and 20% Garganega grapes. The resulting flavors include notes of fruit and vanilla; the vanilla contributes to a lightly creamy taste. Gran Passione Bianco pairs well with grilled chicken, soft cheeses, pastas, and hearty seafood dishes. Choose a white wine glass for this wine. Gran Passione Prosecco is a sparkling wine that also originates in the Veneto region. This Prosecco is made with 100% Glera grapes, a type of grape that is the quintessential grape for several sparkling Italian wine styles. It has small bubbles, making it noticeably less fizzy than your average Champagne. Gran Passione Prosecco is fresh and light on the palate, making it an ideal companion for hors d’oeuvres, sushi, fish, or shellfish. Use a tulip flute (affiliate link), if you have one; if not, a standard Champagne flute will also work. Are you trying out a few bottles for yourself? Remember the proper wine tasting order. Sparkling wines first, then whites before reds, and reds before sweet wines. If you want to get even more specific, check out these guidelines. Gran Passione Prosecco, a sparkling wine, would be tasted first; Gran Passione Bianco, a white wine blend, would be tasted second. You can search for these wines at Winesellers, Ltd. to find them in your state. Are you wines aged in oak or steel?